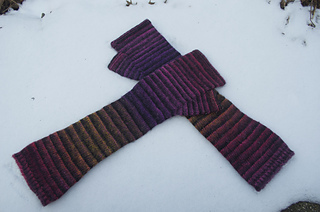 These arm warmers are worked in the round in stockinette stitch beginning with a twisted rib cuff and ending with a garter stitch border at the knuckles. 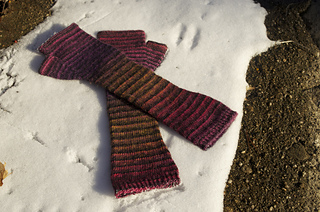 A shaped thumb gusset is worked for comfort and warmth. These arm warmers are designed to fit very snugly so as to stay secure and keep a low profile under a long sleeve. As hands and arms come in a variety of sizes, the key widths and lengths for the finished piece are given above; adjust as necessary to achieve the best fit. 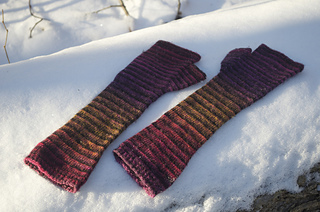 On a cold day, indoors or out, these arm warmers make a tremendous difference in how warm you feel.